Bat For Lashes are back in July with their fourth album The Bride, and signed copies are available for pre-order. The ‘band’ is of course Natasha Khan and the new record sounds promising; a concept album that follows the story of a woman whose fiancé has been killed in a crash on the way to the church for their wedding. In the narrative ‘The Bride’ flees the scene to take the honeymoon trip alone, resulting in – we are told – “a dark meditation on love, loss, grief, and celebration”. You can hear In God’s House from the album below. I’m mentioning Bat For Lashes here on SDE because I found 2009’s Two Suns an incredibly rewarding piece of work – it is probably one of my favourite ‘new’ albums of the last 10 years. So if you’re not familiar with their music, it’s worth checking out. Natasha Khan, Imogen Heap and Florence are probably the three best “new” (not that new, actually) female artists in a looooong time. Love each and every one of their albums. Will get The Bride as soon as I possibly can! She has built up an impressive body of work and any new material is a must buy for me. I’ve played all her albums to death and they get more interesting with every listen. She is one of the few modern artists to break through my old fogey resistance to listening to anything new, so I’m very grateful to her! by secondary sellers . Will this be available via amazon? There is an ‘indies only’ double green vinyl, a bit like the Radiohead white vinyl. Doubt we’ll see it on Amazon… although once it’s out marketplace sellers might sell some. She’s ten years into a successful career. Do we need to try and categorise people like that…? Hilarious. A statement worthy of Alan Partridge. File with: “Wings –the band the Beatles could’ve been”. Anyone in on or near London may be interested to know tickets have just gone on sale this morning (March 18th) for a BFL one-off gig at Union Chapel, Islington, on 16 May. Might be the first opportunity to hear the new material. Great artist. More non-heritage artists on SDE, please! Stood in front of her at Boston Calling performance. Fantastic. Ordered. Thanks Paul. PS Any Kate Bush news love? I love Two Suns, I’ve got it on vinyl, looks like it’s quite rare now and goes for quite a lot of eBay. Daniel, Pearl Dreams, Moon & Moon, Siren Song, all amazing songs. Loving In Gods House, will definitely get this album on vinyl. Would really like Two Suns on vinyl, so if anyone has a ‘spare’ set :) I thought the CD+DVD deluxe of Two Suns was really good. Personally, I just about preferred ‘the haunted man’ to the first 2 albums, I found it more, err….haunting. There is a deluxe edition of The Bride available via the official site with a deluxe price tag of £59.99, complete with, God preserve us, ‘air freshener from the bride’s car’ – what a stinker! love Two suns. at the time I was real disappointed the single download (and then album version) of daniel was not the same as the one in the video for the song. looking at wikipedia now I think that it was this?? It’s on a promo CD which I have. Worth picking up all the promo CDs from Two Suns, because of radio edits, instrumentals etc. thanks so much Paul. had no idea it was on the promo cd … 7 years later I can finally get the version I fell in love with! cheers … didn’t even know there was a ‘Daniel instrumental. will def be looking into other BFL promos from that era. Love her! She takes a healthy time between records and I didn’t know a new one was coming. She definitely belongs to the group of artists from this generation that are worth checking out. Ah, those two magic words – ‘eagerly’ and ‘anticipated’. She’s that rare thing these days – an artist that grows with each album and tries something different while still keeping quality control fully engaged. A great collaborator, too: last year’s Sexwitch mini-LP with Toy was excellent stuff, and her tracks with Jon Hopkins (‘Garden’s Heart’) and Beck (‘Let’s Get Lost’) are well worth getting to know if you’ve not encountered them before now. Thanks for the heads up. I’ll definitely check this out – I’ve thoroughly enjoyed all her previous work. 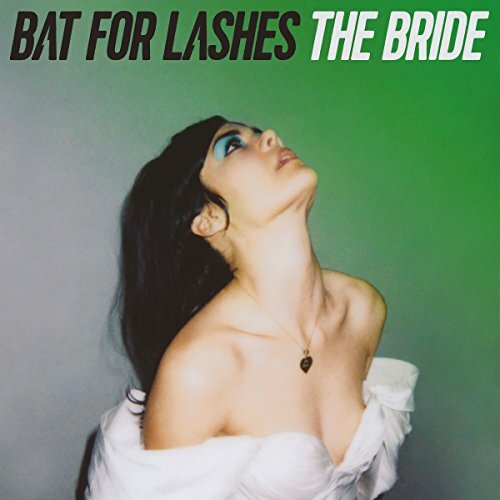 I agree with you on Bat For Lashes. I don’t embrace many new artists these days, but I love all three of her albums. Thanks for the heads up. I didn’t know she had a new one coming. Looking forward to it. Ordered! About a week ago I also ordered something on Amazon UK that was listed as a box set with 4 discs, for just 10.99. It seems to be gone now from Amazon, but I still have it in my orders. There’s a deluxe vinyl & CD (& Air Freshener!!) set – if you ordered that for £10.99 you’ve got a bargain! What I saw on Amazon UK was a three disc box set for £14.99 (took a screencap of it) The ASIN number was ‘b01cnv2fug’ googling that number comes up with nothing. This was before the standard CD appeared and didn’t feature the artwork. At the time I thought it may include a DVD of Natasha’s short film ‘I Do’.